A groundbreaking black jurist who became the first Muslim woman to serve as a U.S. judge was found dead in New York’s Hudson River on April 12, police said. Sheila Abdus-Salaam, a 65-year-old associate judge of New York’s highest court, was found floating off Manhattan’s west side at about 1:45 p.m. EDT (3:45 p.m. GMT), a police spokesman said. Police pulled Abdus-Salaam’s fully clothed body from the water and she was pronounced dead at the scene. On Wednesday, after responding to an emergency call, officers with the New York Police Department’s Harbor Unit found the body of Judge Abdus-Salaam, the first black woman to serve on New York State’s highest court, in the Hudson River in Harlem with no apparent signs of trauma and no indications of foul play. The police are treating her death as a suicide, although an investigation is continuing. Abdus-Salaam graduated from Barnard College and received her law degree from Columbia Law School. She became a public defender in Brooklyn after law school, the New York Times said, representing people who could not afford lawyers. In one of her first cases, she won an anti-discrimination suit for more than 30 female New York City bus drivers who had been denied promotions. Well, let’s hear from the USA. The whole world is waiting to hear your story, guys! Can you spot this unexpected thing on Noah’s Ark? I learned two items of trivia today that gave me a smile. The first one turned up as I was browsing Yahoo UK’s news of the day. It referred to a picture someone had found in a children’s book of Bible stories. 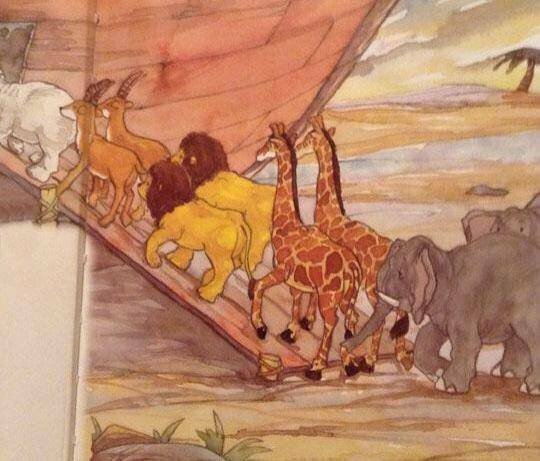 ‘Can You Spot Something Unexpected In This Noah’s Ark Children’s Bible Picture?’ challenged the headline. My first thought was, there’s only one rhinoceros. But then I spotted it. As the writer pointed out, ‘There were two elephants, two giraffes, two gazelles, etc. But according to this picture – there were also two gay lions.’ See them there? So, not only are the lions gay, they will also be vegetarian. 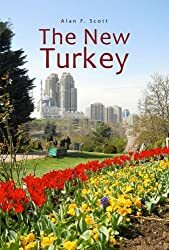 Very New Age! But I want you to know, I’m smiling here, not mocking. I fully appreciate what the prophet Isaiah wanted to say. If religion has any real value for humanity, it must be to bring understanding and peace to a world blighted with conflict. So I guess that’s how you can spot the truly religious in any faith. The war-mongers don’t make the cut, whatever they try to tell you. And maybe learning to smile about it will remind us not to take the outward trappings of institutionalised religion too seriously.